It’s showtime, folks! The ghost-with-the-most storms the stage in this edgy and irreverent original musical based on Tim Burton’s wonderfully demented film. 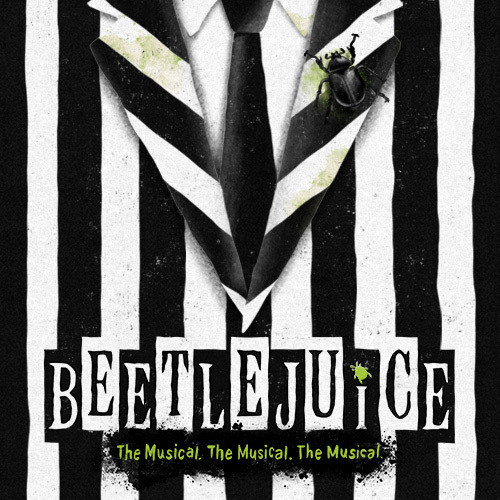 Beetlejuice tells the story of Lydia Deetz, a strange and unusual teenager obsessed with the whole “being dead thing.” Lucky for Lydia, her new house is haunted by a recently deceased couple and a degenerate demon who happens to have a thing for stripes. When Lydia calls on Beetlejuice to scare away anyone with a pulse, he comes up with the perfect plan involving exorcism, arranged marriage and the biggest sandworm Broadway has ever seen.